My edition: Paperback (proof), published on 23 April 2015 by Hodder & Stoughton, 432 pages. Description: What can you do to make the world a better place? Libby helps a stranger, and transforms her life in the process. I was really impressed with Lucy Dillon's One Hundred Pieces of Me when I read it last year, which had such a beautiful concept at the heart of it, and when I got to go to the fabulous launch party and even interview its lovely author I was definitely sold and eagerly anticipating the latest title by Lucy's hand. I wasn't disappointed. When Libby and her husband Jason exchange their busy lives in the city for taking on Jason's mother's hotel in the countryside after his father passes away, to their friends it sounds like an idyllic change of pace for the married couple. And Libby is initially excited too as she has many plans for turning the dated B&B into a modern boutique hotel that all her sophisticated friends from London will want to visit. But the renovation is a lot more stressful and expensive than Libby anticipated, putting a strain on her marriage and the already testy relationship with her mother-in-law. Even though she's spending more time with her husband than before, being far away from her friends and her old job, not to mention Jason's reluctance to communicate openly about what is really going on, makes her feel more alone than ever. A woman is walking up to the hotel when she gets hit by a car. When she wakes up in the local hospital she has no memory of why she was there or even who she is, and because there was no purse or phone found on her, her identity remains a mystery. While Libby doesn't know her, having found her right after the accident she feels an obligation to check up on Pippa, as the woman calls herself for the time being, in the hospital – and the two quickly bond over a mutual lack of friends in the area. With a similarly styled stunning cover and title, One Small Act of Kindness is definitely a continuation of the Lucy Dillon 'brand' for Hodder & Stoughton. It means that the reader instantly knows to expect a beautifully written novel filled with lovely characters and a heartwarming story. Despite the hardships the characters endure, the story was also uplifting and reading it made me feel all warm and fuzzy inside. It's basically a big, comfortable hug in the shape of a book and who doesn't love a hug that you can take with you wherever you go? Libby is the most central character within the novel and seeing a lot of the story develop from her perspective I instantly felt a connection to her and the struggles she was facing in her life. Because while on the surface the hotel may seem like an exciting challenge for those who knew Libby in her old life, there is a far more devastating reason behind the change in jobs and one that continues to make life hard for her and Jason. And Libby's mother-in-law certainly didn't help in that regards. While her back story provided some explanation for her unkindness and stubbornness, I still wanted her to give her a good shake and make her realise what a wonderful daughter-in-law she had in Libby, not to mention make her stop sulking and provide some much-needed support in what was a difficult situation for everyone. Thankfully Pippa brought a ray of sunshine and perspective into the lives of them all. While her identity was shrouded in mystery, adding an unexpected touch of intrigue to what I had assumed to be a romance novel, she was an instantly likeable character and one that I quickly fell in love with as much as I did Libby. They were both very well written and with compelling stories that went through quite a lot of twists and turns, keeping this a fascinating and unpredictable read. 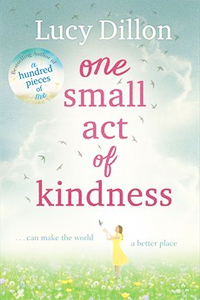 While One Small Act of Kindness very much focuses on the lives of Libby, Pippa and those within it, it's the titular small acts of kindness that run throughout that makes this novel so very special. In today's fast-paced age we as a society are so focused on ourselves and what's going on in our immediate vicinity, that there seems to be little time for kind gestures towards other people when it isn't needed. This book shows that it doesn't have to be a life-changing or time-consuming act of kindness that can make a world of difference to another person. So after reading this review, and of course buying your own copy of One Small Act of Kindness, have a think about what you can do to help someone else. The uplifting message of the novel doesn't have to stay confined within its pages, wouldn't it be wonderful if we can see it spread one read book at a time? You can purchase the novel from Waterstones, Amazon.co.uk or your own preferred retailer. Many thanks to the publisher for copy of the novel through bookbridgr in exchange for an honest review.